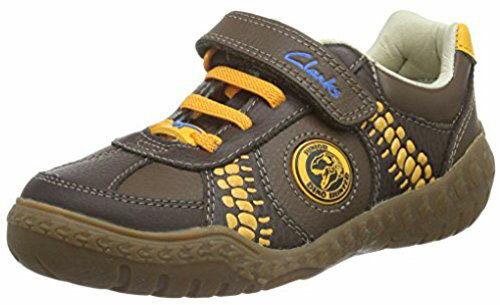 Clarks Stomp Roll – junior dino hunters love the Clarks Stomp Roll boys’ shoes from the Stomposaurus range. Crafted with brown leathers, these boys shoes are embellished with dino effect skin and bone print detail as well as contrast stitching. 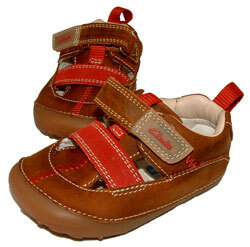 Padded collars add comfort and support while an elastic lace and velcro fastening secures the foot. Underfoot, durable rubber soles feature dinosaur claw detailing for fearsome footprints. Lines with naturally antimicrobial Agion, the Clarks Stomp Roll boys trainers help to keep feet fresh after a long day for stomping!